Hey ladies! I'm in the process of writing about "Growth & Length Retention" in the Twist Series. Feel free to add questions in the comment section that I can address in the post. thanks for being so charitable as to provide this info for us thirsty readers! here's my query: since taking down my 10 year old locs, i have "dusted" my ends but not gone for a professional trim. i've worn my hair in some form of natural for 15 years now, but this is my first time really on a "length" journey, so i'm trying to familiarize myself with all the new products, info, and various strategies. As such, I am wondering how crucial regular trimming has been for you. @Camille Acey: You're welcome! Awesome. I'll address the question in the upcoming post. Thanks. While maintaining twists, how can you prevent the ends from getting tangly (scraggly)? How often should you trim while wearing twists? When is the best time to start pinning them up? I'm noticing that I'm losing some length due to damage at the ends, though I've been wearing my hair in twists as a protective style for the past few months. 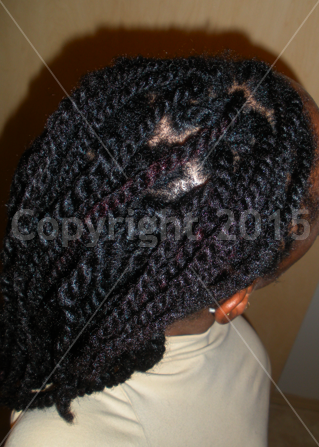 i second the question on how to prevent tangly ends while in twists. they feel detangled before i twist them, but when i take them down i sometimes feel the tangles. I want to know how often should you moisturize in twists? I tend to do it everyday, and my hair ends up fuzzy!